Posted on 8, April 2016 by EuropaWire PR Editors | This entry was posted in Automotive, Electronics & Machinery, Industrial, Switzerland and tagged 36V op amps, semiconductor, STMicroelectronics. Bookmark the permalink. 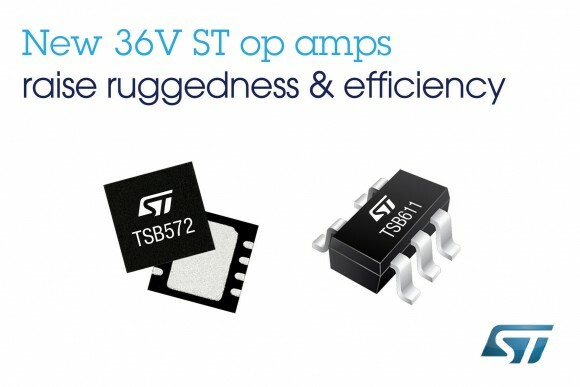 GENEVA, 08-Apr-2016 — /EuropaWire/ — STMicroelectronics has introduced two 36V op amps that deliver enhanced performance and ruggedness in automotive and industrial applications. The op amps feature a wide supply-voltage range, stability in challenging operating conditions, and tolerance of electrostatic discharge (ESD) up to 4kV (HBM1 ). The TSB572 and TSB611 single op amps are the first devices produced using ST’s new 40V-ready BiCMOS2 semiconductor process. This technology delivers superior GBW/Icc3 efficiency resulting in about five times lower supply current in relation to performance, compared with standard op amps. In addition, low input-offset voltages with temperature drift below 6µV/°C simplify system design, eliminate any need for trimming or calibration, and ensure consistent performance over the specified temperature range -40°C to 125°C. The TSB572, with rail-to-rail inputs and output, has 2.5MHz gain-bandwidth (GBW) and 1.5mV maximum input-offset voltage. The op amp is stable with capacitive loads and highly resistant to phase reversal. Its broad supply-voltage range, from 4.0V to 36V, allows reliance on specified parameters with a wide variety of power supplies. The TSB611 has 560kHz GBW and can operate from a supply voltage as low as 2.7V. It is a unity-gain-stable device, and has extremely low input-offset voltage of 1mV as well as frugal operating current of 125µA (max.) at 36V. Compact package options make ST’s new op amps ideal for use where space is tight, such as in automotive audio systems and Electronic Control Units (ECUs). The TSB572 is in mass production now in 3mm x 3mm DFN or Mini-SO8, priced from $0.80. The TSB611 in SOT23-5 is also in mass production, priced from $0.55 for orders of 1000 pieces. 3GBW/Icc. Gain-bandwidth per input current: industry-recognized figure of merit relating op-amp performance to power consumption.